Supplier of Plotter CAD Paper Rolls Sheets Plotter Media Supplies for over 20 years, we are a family owned Company and take pride in all of our products, let our years of experience help you achieve quality print projects. We understand that in today’s economy how important it is to save money so we put a lot of effort into bringing you high quality papers at the lowest prices possible. Ricoh plotter papers works great in a Ricoh plotter sometimes called a Ricoh copier. The Ricoh uses Toner and takes 3 inch core plotting rolls you can find those on plotter-papers-rolls-com by clicking on menu at top of page for plotter papers and looking at the Engineering Plotter-papers (3″core) section on the menu. If you need assistants feel free to call our 800 number where you will always get live support to help you, customer satisfaction is guaranteed because here @HpPlotterpaperss Rolls it’s all about you, we appreciate your business and continuous support. HP plotter papers is not a conundrum. We carry American made plotter papers that fits every HP designjet and or every Hewlett Packard plotter printer. Our plotter papers for hp is designed with hp printers in mind and meets or exceeds all hp requirements of quality. 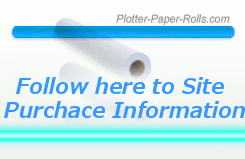 Look us over for your hp plotter printing papers by clicking here for hp plotter papers. HP made the head spraying technology an office hold word InkJet . Hewlet Packerds Inkjet idea of spray heads that spray droplets of ink on papers (specific processed type papers) gave the office of large businesses and soon after of small businesses the ability to create large-format printing in masses. Large document copying was one thing, yet having the full color spectrum on your prints gave the creative mind room to have fun and grow. Oce plotting papers has good story line. First I learned the definition of Oce Plottin Papers – ha – ok The Correct Story is a German based company can show roots back to the Netherlands with food coloring. It was in the 18th century when their additive was used in coloring butter then later margarine. As most growing industrial companies of the early 1900’s, Oce continued to grow in development of different level colorants and soon held solid ground as a main player in the manufacture of reprographic machines and supplies. At this early time it was about the mass copying large document technology as diazo and blueprint papers. As the American Dietzgen brothers showed turn profit, opportunity attracted Oce from Germany to the US and upon signing up an American to sell their product here they set up office across town from Dietzgen in Chicago Ill. Here was Oce and their line of office products capturing a new coin in our ever growing USA with great large office printing machines and materials. As the idea of reproductive material and the way it was used expanded, so did the company as they released several quality machines including. For almost a decade in the late 1930’s Oce had a diazo application that allowed copies to be made of non-translucent originals. The process, known as RetOcé, and was the only process available for making copies at the lowest cost and ease. Electrophotographic copying replaced the RetOce technique in just a few short years attention from most reprographic companies at that time was moving to office copying machines and paperss. The third year of the 70’s marked Oce’s introduction of their first office copier, the Océ 1700. It was 1983 when Oce introduced its first wide-format plain-papers copier named Océ 7500. The demand for plain papers copiers became called engineering copiers and has grown in demand since. With each copier printer machine released by Xerox, Oce, Ricoh Canon and HP and companies alike, more and more offices and companies in the USA were able to afford the becoming cost effective duplication printers and media. Océ TDS450 * Océ TDS600 * Océ TDS750 * Plotter Papers for Oce plotter can be found @Plotter-papers-rolls-com – Great papers great price. In 2009 Canon began to look at carrying and producing a large portion of the Oce printing machines and line. Oce printing papers is now under the same American 20 Plotter cad Rolls company that holds the Dietzgen papers line so any user in America can be assured of finding great plotter papers for their Oce plotter printer. We care about your outcome. For over 65 years of industry experience and online dedication to you for 18 years tried true and trusted Plotter-papers-Rolls-com All our papers is factory fresh and ships from 26 different locations across the good US so you can get your papers faster and less expensive. Canon Matte Canvas, Canon Fine Art Water Resistant Canvas for Inkjet 50″ Wide Roll – 40ft long, also Canon vinyl and find Canon Scrim banner plus all the Canon iPF sizes for Canon large-format printing plotting and use of Canon economy bond is found here. Below is a line up of some of our product you can find here – if you need any assistance please call us.